Did you have your kleenexes, folks? Because man, that finale took a lot out of me. I went into the finale with some predictions and low expectations. That’s hard to say outloud. Low expectations? Why, Raked, how could you? I know, I know. But considering all the ground they had to cover and the fact that J.J. Abrams isn’t the most stellar at closing up loops with iconic series (I’m still a bit miffed at the Lost finale), I just didn’t know how they’d sum it up. Well, I was pleasantly surprised. Not only did they sum up everything (ok, yes, there may be some lingering questions, but nothing too bad), but as moment by moment went by in the final episode, we got so much closure with our favorite Fringe characters, and based on what I was seeing on twitter, I wasn’t the only one with tears streaming down my face at the end. We all knew that somehow Walter was going to be a big player in this finale. He was really the reason that the world was what it was when he crossed over to grab Peter way back when, so we knew he needed to come full circle somehow. I thought he might die. But once the episode(s) started, we saw that he had a different fate: living the rest of his life in the future. Of course, there was a brief moment when September was going to take his place. But even that was shortlived, as September took a bullet, and Walter took Michael’s hand. It was a bit of a bait and switch — the viewers felt that Walter was safe, and in the end, we still had to say good-bye. Michael, to me, was just so interesting in these final moments. For being a phenomenon — one that was Observer but still harbored the emotions of humans — you really didn’t see much of that emotional side. It wasn’t until September’s death that you realized that the reason was not because he didn’t feel them; he just didn’t know what to do with them. Instead of crying at September’s side, he went into himself. Sitting alone, playing with the music box that September introduced to him, not knowing what else to do. We learned it from Lost and we’ve seen it here: Abrams does not know how to age people. That being said. seeing Faux-livia and Lincoln again was a great addition to the finale, synchronized guns and all. The hallway scene was incredible — and a great nod to episodes past. I was very pleased to see that early Fringe cases were not forgotten, even in the future. I’m rather distraught to think about how Astrid will never know Walter’s final words that her name was beautiful. Once they fixed the past, that conversation never happened, and she’d always think that he just never knew her name. I’m going to miss this show, but kudos to that final Friday night. And I’ll be keeping my fingers crossed that this talented group of actors gets some new work soon. We’re more than halfway through the final season of Fringe, and with all the recent references to cases from the first few seasons and a few weeks off, I thought I’d spend a little time with a book I recently received for review: Fringe Science: Parallel Universes, White Tulips, and Mad Scientists, edited by Kevin R. Grazier. The book came out about a year ago, and it is a collection of essays and papers that discuss, well, the science behind Fringe. As someone who has happily devoured Buffy the Vampire Slayer and Philosophy and even has dipped her toes into The Physics of the Buffyverse and Inside Joss’ Dollhouse, I thought it would be fun to see what these various contributors have to say about Fringe and its various uses (and disuses) of science. For a Fringe fan, it’s a fun flashback. The book only goes through the first three seasons, so the answer to the question, “Where is Peter Bishop?” and anything discovered in seasons four and five of the show aren’t known, but despite that, it was fun to read and follow. As with any collection of essays, some are better than others. While I did read it cover to cover, feel free to skip around to the subjects that interest you most. As a TV fan, I love to feel like I’m part of a special club — the insiders of the series — so the essays that really delved into the specifics of characters and episodes grabbed me the most. There were a couple that did delve a little too much into the science or even literature that I wasn’t familiar with, and those I’d probably skip in another reading, but for those that had a solid foot in the Fringe door, it was a lot of fun. The book drew me in with its first essay by David Dylan Thomas, “Paranormal Is the New Normal,” so much so that I stayed up way past my bedtime to read it. I also particularly liked Stephen Cass’ discussion of space-time and time travel in “Of White Tulips and Wormholes”; of course, I’ve always been one to dwell on the intracacies of time travel (which makes my current theory about Peter a rough one to prove). Also worth reading are Brendan Allison’s “The Fringes of Neurotechnology” (a bit technical in the science, but fascinating with a great link between the show and science) and Amy Berner’s “Moo” (who wouldn’t love an essay devoted to one of the show’s must underappreciated characters, Gene the cow; it was a fun break from some of the high-level science). Of course, if you’re not interested in science, this one may not be for you, as it really is the focus of the book. But if you like thinking through what’s real and not real in today’s reality — and what could be true or false in Fringe science — it’s a good read. In the time before the show returns (or when you’re desperately needing more after the series ends), it’s a good one to pick up. While Peter’s rage was no surprise, what he did certainly was. I was certainly reacting (audibly) when he inserted the tech into his own neck. Honestly, for a rather boring episode, I was pleased with the ending — though I can’t say I like what’s happening next. Now, focusing in on Peter, I had my suspicions that perhaps Peter is becoming not only an Observer, but the first Observer. Based on the tuft of hair we saw in Friday’s episode, I think the first part of this statement is true. Peter is becoming an Observer. But the first? Well, I don’t know. Pushing all time analysis aside, it’s possible. The Observers are from the future, so wouldn’t it make sense that they have to start somewhere? Could Peter have just become the one thing he’s fighting against — and the start of it? Either way, it’s rather disappointing. While I like how he’s planning to take them out (especially since we’re getting some tastes of nostalgia with attacks from season one episodes), I’m bummed that it really looks like he and Olivia are falling apart. Unless we can fix him — and with just a few episodes left, it seems unlikely — methinks our favorite Fringe team may be over. Meanwhile, we have Walter. Now, I love Walter’s quest to become a good person, to fight against that urge to be a bad person. It was what he was talking about at the end of the episode where the man died in the pocket world. His ambition blinded him, and he cared little about one last life. Now, on the one hand, this is war, and there can be “acceptable casualties,” but if you’re losing your compassion in the meantime, that’s not good. But I do have one issue with this focus on Walter. Since the high-ambition Walter was in the time period we didn’t get to see, it’s hard to see his struggle. How do we know if he’s becoming the hard-edged, super-ambitious man if we’ve never seen him be that before? In fact, the man he described sounded more like the man of the faux world (of Faux-livia) than anything else. Unless I misunderstood Walter. If you know better than me, please share! But either way, I’m just glad to see character development continue, even in the final season. With both Peter and Walter, it looks like there’s a rough ride ahead. But I can’t wait to see it. The final season of Fringe takes us one step closer to the end, with familiar faces and last good-byes. What happened this week? Well, if you’re like me and decided to watch it late — and you haven’t yet checked it out — I’d suggest you stop reading. I’ve probably already said too much. As it turns out, I knew something pretty big was going to happen before I watched the episode. So I saw nervously the entire episode, wondering who was going to make it and who wasn’t (and if it wasn’t as extreme as a character death, who would be horribly dismembered — I don’t know if that’s being trained by Joss Whedon or American Horror Story). In the end, it was Etta who took her last breath and took quite a number of people with her. I can’t say I’m too disappointed. Sure, my fear was that it’d be Peter, Walter, Olivia, or god forbid Astrid! But I can bet that Etta won’t be the last death in this final season, and she certainly won’t be the one that hurts the most. I have my own predictions on that one. I don’t want to say I was happy to see Etta go, but I can’t say I’m all that disappointed, either. I haven’t been the biggest fan of Etta — it’s not that I didn’t like her, it’s just that I didn’t fall in love with her the way that Peter or Olivia, her parents, did. And honestly, her presence on the show has just hidden a lot of what I’ve loved about Fringe in the first place. With Etta hanging around, I feel like we haven’t really seen Walter, for one. At least not to his full capacity. His craziness is diminished, partially because his memory has been tainted but also because it’s just not the same dynamic that we knew. More so, I’ve really missed Olivia. While I’m sure the writers didn’t mean for it to become the battle of the blondes, I feel like we really haven’t seen Olivia at all since Etta came into the picture. All the action has been around Etta, and all the touchy feely emotions (which I can’t say has been Olivia’s strong suit — or as interesting) has been around Olivia. Poor Olivia’s been pushed to the background in favor of her younger generation. But this death is clearly going to mean something. I can see Peter’s reaction to the death will be powerful. I think the word that comes to mind is rage, and I think we’ll see that in future actions. Most of all, I just hope that Etta’s demise will lead to a happy reunite of Olivia and Peter, since, you know, that’s all I really care about here anyway. So what did you think of this week’s episode? Are you sad to say bye to Etta? Let it out in the comments. It’s taken me a long time to write about last Friday’s episode of Fringe, mainly because I haven’t had many positive thoughts about it. Honestly, I haven’t had many thoughts on it at all, and those that I have had weren’t all that great. The quest to find the tapes sounded like we at least could guess the direction that this season would be taking us. Unfortunately, if last Friday’s episode was any indication, it’s not going to be a great ride. I cared little for this community of fungal recorders, and I really just wanted to get back to the drama. Am I heartless? Perhaps. But let me explain. Clearly, whatever was infecting these people was bad. It killed whoever went down into that mine almost on contact. But these people were also able to survive it in whatever small dose they were exposed to. So the threat didn’t seem all that real when Walter and Olivia started showing signs of having it. In the end, we never really discovered if their infestation was going to have any bad repercussions. It was just…there. Meanwhile, the story with the man who eventually sacrificed himself was a little tedious. He was a cowardly, flip-flopping guy, and while I think the writers did a good job leading up to the surprise of his sacrifice (for a while there, I thought he just blew up the mine), it felt a little lackluster. Of course, he would sacrifice himself, especially given what it would mean for his son. I was left feeling sad. Not emotional or invested, just sad and a little let down. The episode was just lacking for me, and the payoff was dull. The highlight of the episode was seeing the Fringe comics and hearing more about Olivia and Peter’s relationship, but those were brief moments in a rather long episode. In the end, I would have left the roadtrip in PA to our imagination, and spend my time with Astrid in the Harvard basement. Those are just my thoughts. What were yours? A reader dropped me a note today (thank you!! ), asking my opinion of the new season of Fringe, which finally snapped me out of my non-reviewing and made me go: Raked, it’s been at least a week since you reviewed something. You’ve been wanting to react to this very different season of Fringe, now do it! So here I am. Openly admitting to what I think so far about this new, different, dystopian final season of Fringe. First and foremost, when I caught the season premiere, I kicked myself. We did have one brief encounter with this world last year. It wasn’t the finale, but I believe the penultimate episode, where we met Etta and joined her pursuit to find her parents and save the world. Unfortunately, having not realized what this season would bring, I didn’t think about going back and watching that VIE — Very Important Episode. So while I wasn’t completely lost, I did feel like I was at a disadvantage. I still have yet to rewatch that episode, so I’m just going along. I’m incredibly intrigued to discover what happened to bring this future that we’re seeing. So far, we’re seeing two different versions of the months before the amber, where Etta disappeared and Peter and Olivia are reacting in the park. We’ve seen it from both their points of view, but that doesn’t mean we know any more about what happened. What I find interesting, though, is how these events separated our favorite couple Peter and Olivia. After four seasons of wanting these two crazy kids together — and finally seeing them GET together — the writers successfully brought that sexual tension back by revealing that Etta’s disappearance broke these two apart. Now all I want by the end of the season is to see these two back together. And, of course, the world fixed and made a better place. Which brings us to the future, namely, Etta. What do we think of Etta? Etta hasn’t shown us too much of herself in the episode last season and the premiere, but we sure learned a lot in Friday’s episode. Namely, who is she really? She’s tough. She’s rather vengeful. She’s got one purpose in mind. And she’s a little frightening. The way she tortured that guard (who in the end, I do believe really had a son, but I guess we’ll never know) was just a frightening scene. And the look on her face when she saw her friend being experimented on…that’s not someone I’d want to mess with. But there are things that can penetrate that forcefield. Namely, Olivia. Somehow Olivia was able to convince her to keep the guard alive when everything was telling her not to. Olivia’s still got a fresh perspective of hope, something that has been beaten out of this world, and it’s refreshing to hear her kindness. So if the future is here, what’s next? Walter’s memories have been lost (by the way, the scene with him in the car listening to music was brilliant), and now the crew will have to look for five video tapes to put together the plan to save the world. At least we know where this season is going, but it doesn’t look like it will be a peaceful ride. Personally, I like the direction of this season, even if it was a surprise to me. It seems fitting for the end of the series, and I’m still left with the many questions that Fringe demands you ask week after week. But what do you think? Good, bad, or ugly? Your call. Fringe Renewed for Fifth and Final Season! Ok, so I was going to leave it to Twitter to talk about the FANTASTIC NEWS, but I just can’t contain myself. 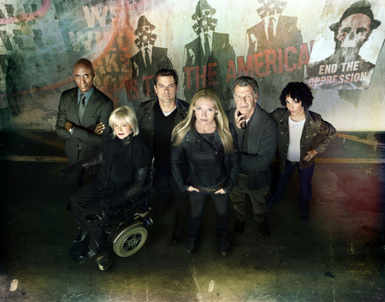 Fringe, FOX’s ever bubble show, has been renewed for a fifth season. The season will be its last — a 13-episode order — but it will push the show to its 100th episode. Quite a milestone for the precarious paranormal bunch. I could not be more thrilled with the news. I’ve been and off-and-on watcher (yes, shame on me), but in recent seasons, I’ve really been doing my best to keep up with the show. And even when I wander away, I still get pulled back in with the story arc and, let’s face it, Joshua Jackson on a weekly basis. And I’m not the only one. Remember when Fringe won TV Madness? I’m so excited about this happy news! And what’s more? FOX already has a promo. Check it out. Yes. I just got goosebumps.